The Senate's vote on Supreme Court nominee Brett Kavanaugh approaches, with the completion of an FBI report on sexual misconduct allegations. On Thursday afternoon, anti-Kavanaugh protesters marched along Constitution Avenue to the Supreme Court Building and then protested inside the Capitol as well as the Hart Senate Office Building. WASHINGTON — The Senate’s vote on Supreme Court nominee Brett Kavanaugh approaches, with the completion of an FBI report on sexual misconduct allegations. On Thursday afternoon, Anti-Kavanaugh protesters marched along Constitution Avenue to the Supreme Court Building and then protested inside the Capitol as well as in Senate office buildings. 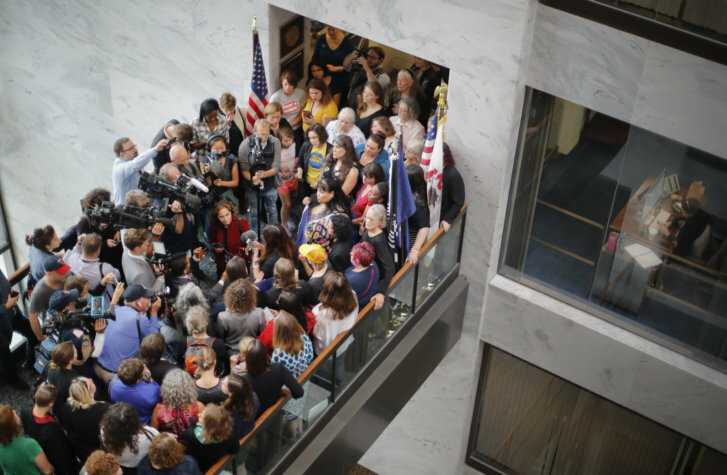 In all, 293 were arrested “for unlawfully demonstrating” in the Hart building, U.S. Capitol Police said, and nine were arrested on the fourth floor of the Dirksen Senate Office Building. Protests continued into Friday, as the Senate set the stage for a final vote to confirm Kavanaugh over the weekend. Here are scenes from those protests.